Webster Hall, located on 11th Street between 3rd and 4th Avenues, is notable not only for it’s handsome Queen Anne and Renaissance Revival architecture, but also for its remarkable legacy as a public gathering space. In the 19th century, the streets around Union Square were filled with similar grand assembly halls, but Webster Hall is special for being one of the few survivors. Constructed in 1886-87 with an eastern Annex added in 1892, Webster Hall has changed from general meeting hall to legendary concert venue and everything in between. If the walls of Webster Hall could talk, they would tell of bold socialist organizers, iconic American authors, counter-culture anarchists, and brash rock-and-roll stars. In 2017, the venue was sold and is currently undergoing a major interior renovation and a freshening up of the exterior. Its planned reopening is spring, 2019. While we were unable to save the row of five-story, old law tenements built between 1887 and 1892 directly across the street from Webster Hall, there are others in the East Village that can still be saved. Click here to take action to help save other area buildings. 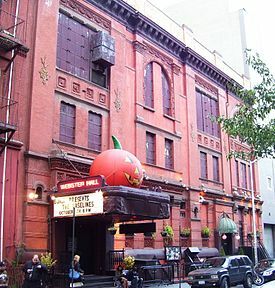 Click here to read more about Webster Hall. The Elizabeth Home for Girls was constructed in 1891-2 as a refuge for homeless girls by the Children’s Aid Society on 12th Street between 1st and 2nd Avenues. Designed by renowned architect Calvert Vaux in a High Victorian Gothic style with a Dutch-influenced stepped gable, this building is one of just a few survivors of approximately twelve that Vaux designed for the Children’s Aid Society in the 1880s and 90s. Vaux was interested in the way architecture could be used to better the lives of unfortunate members of society and devoted much of the last part of his career to this cause. In 1984, the building changed ownership and was converted to co-op apartments. Click here to read more about Children’s Aid Society Elizabeth Home For Girls. In the late 19th century and early 20th century, hundreds of small synagogues were built throughout the Lower East Side and what would become the East Village to meet the needs of the hundreds of thousands of Jewish immigrants who lived in the area. The Beth Hamedrash Hagadol Anshe Ungarn, meaning “the Great House of Study of the People of Hungary” was founded in 1883 with the arrival in New York of large numbers of Hungarian Jews. The congregation purchased this property on East 7th Street between Avenues C & D in 1908. Architects altered the existing three-story brick house with a pitched roof, removing front and rear walls and extended the building by four feet in the front and by 32 feet in the rear. The stone facade was finished in a refined, classical style, with highly developed details and fine workmanship. The new sanctuary seated 500 people and flourished through the first decades of the 20th century until demographic changes led to the vast exodus of most Jews from the neighborhood, and the accompanying closure of most of the synagogues. The congregation maintained the structure until 1975, when they abandoned the building. In 1984 the building was purchased by a developer and in 1987 the first co-op apartments were sold. Click here to read more about this building. This neo-Italian Renaissance style building located 538-540 East 11th Street between Avenues A & B was constructed in 1904-05 in a primarily Geman-American area then known as Kleindeutschland. It was one of 14 City-operated baths opened between 1901 and 1914 following decades of progressive reforms. The public bath movement, led by Dr. Simon Baruch, pressured the City to open free public baths throughout the crowded tenement neighborhoods to provide immigrants with bathing facilities, as many tenements at the time lacked adequate facilities. Gradually, as laws changed and bathrooms became more prevalent in apartments, the needs for the public baths diminished. This bathhouse was closed in 1958 and was used as a garage and warehouse until 1995 when Pulitzer Prize-winning photographer Eddie Adams purchased the building and converted it into a fashion and photography studio. Click here to read more about this building.